Lovers, back in November of 2009 I introduced you to Tibi’s tantalizing Sequin Blazer as part of a Café Fashionista Tightwad Tuesday post; but with the season of sparkle upon us, I felt that it was high time to revisit the spectacular piece – with an even more fabulous look-alike version for the frugalista! 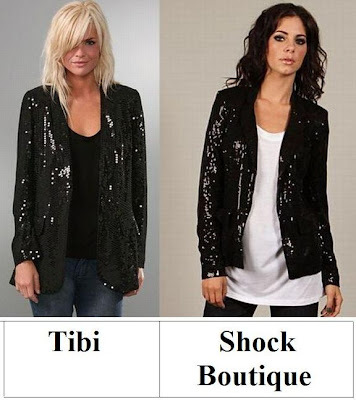 In the left corner, take a peek at Tibi’s Sequin Blazer, sparkling in all of its haute couture glory; in the right corner, allow your pretty peepers to savor the twinkling decadence that is Shock Boutique’s Sequin Blazer in Black – a similar style of which has been seen gracing the form of everyone’s favorite stylist, one Ms. Rachel Zoe. While the Shock Boutique beauty proffers a more feminine fit than the tempting Tibi; for a mere $54.00, in comparison to the $598.00 needed to take the Tibi home, it is the preemptive piece to add to your wardrobe if you’re looking to add a little shimmer to your style – at a price that no glamorous gal could possibly refuse! Thanks to Shopbop and Shock Boutique for the pictures. I'm going to spend the money for The Tibi blazer. I like that it's longer. Have a happy Tuesday. I love, love blazers of any kind. They put just the right polish on an outfit. I'm leaning toward the Shock blazer here, mostly because it looks more fitted, which I prefer. sheesh, i love the tibi blazer...but i can't justify the price! both look great, Erika and I can picture a lady sporting both at an early New Years celebration. but since she would only likely wear it on festive occasions and not as often, I'd suggest being a tightwad this time around! Great finds! I neeeeed a sequined blazer, darling E ~ thanks for finding an affordable one! I wouldn't mind the cheapie version of this look. They're both fabulous! They're both very, very tempting, but if I could, I'd do the Tibi for the extra length! i want i want i want! i have been alllllll about sequins the past few months! so cute! I am not a huge fan of sequin, but they look so great for the New Year's Eve! Love the Shock Boutique one -- so cute! Shock Boutique one for sure! I love sequined blazers! They are perfect for this Holiday/party season! Oh my Lord! I thank my lucky stars I have found your blog! I do like the fit of the Shock boutique but then I like other colour of Tibi's. Lots of things to ponder! The Shock Boutique blazer is gorgeous. I think I'd prefer that one even without the much smaller price tag! i think i like the shock boutique one better, so tightwad it is! Thank goodness for Shock Boutique! I was just looking at the black sequin blazer at J. Crew and of course the Tibi is a much better price and could easily be altered for a tigher fit! Love!!! Thank you dear for your great alternative deals! blazers are everywhere this season and sequins is HUGE so why not put them together.!! perfect i love finding "goodies" that are half the price but looks exactly the same. Anyone in a sequin blazer would look amazing at Christmas parties. They're really similar, so I'm going to have to go with Shock Boutique. This sequin blazer is really cool! I'm so glad there is one affordable. Shock Boutique please! I appreciate the feminine fit. I can't pull of anything "boyfriend". They look so fabulous - but I definitely like the Shock one better. It's so fabulous and holiday-ish. And I like the way it's styled better. Tightwad! This jacket is soooooo cute! Omygosh shock Boutique, can I has?? I want it to wear to work! I think it would be awesome next to all the regular, boring blazers!! I think the tailoring on the Shock Boutique is much better than the Tibi. Great find!! Totally identical! I would totally take the cheaper version! Love them both but would go for the cheaper version. Shock boutique for sure! Another great selection dear! I want that so much for the holidays! yea for sequin blazers. i'm going to check out the one from shock boutique now! Haha, to be honest, I can't really see myself wearing a sequined blazer. If I did though, I'd go for the cheaper one! Shock for sure! I want one of these!!! nice picks. i actually like the shock boutique one the most. would like a blazer like that actually.. While I do prefer the Tibi one due to the longer length, I'm not going to really wear a sequin blazer on a daily basis... probably only every so often. That's why the Shock Boutique one would def. fulfill the sequin blazer need and the cost is the best part! Great post, Erika!